"Old prebends and dilapidated barns had been, for years, the only accommodations Thalia's sons could obtain for the display of their histrionic talents, till the summer of 1816, at which time two large rooms in the house of Mr James Adams, Whitesmith, standing in an indent, adjoining to [the Saracen's Head].... which had lately been used as a depot for the arms of the Southwell regiment of Local Militia were converted into a Theatre, and opened by a company of Comedians under the management of Mr Smedley. It is neatly fitted up, and proves fully competent to the purpose. The public are wisely restricted, in this gratification, to a visit only once in two years, for about six weeks each period". In Shilton's description quoted above, Southwell's theatre is described as having been opened by "a company of Comedians under the management of Mr Smedley. Joseph Smedley (1784 - 1863) was born in Yorkshire, but became a successful actor-manager, with a circuit throughout much of the East Midlands. In c.1800 Joseph Smedley married a Melinda Bullen (Boleyn) of Norwich (1781 - 1870), who may have been an actress at the time. 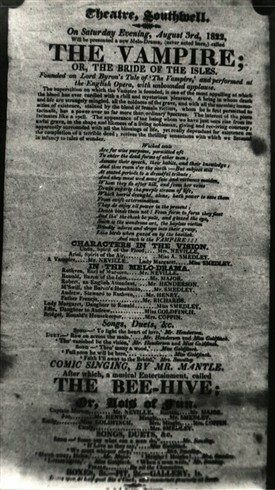 Between c.1802 and 1804 they both worked for the touring theatre company (the Lincoln circuit company) managed by William Robertson (father of Thomas William Robertson, who became a nationally renowned playwright). 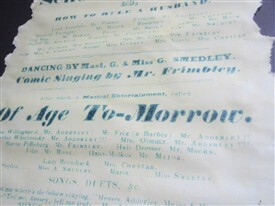 After 1804 it is known that the Smedleys formed their own company and toured incessantly all over Nottinghamshire, Derbyshire, South Yorkshire, Lincolshire and what is now Humberside. At the time his role in opening the Southwell Theatre was mentioned by Shilton (above) he was at the height of his career. A few years later he can be seen as the main actor in the play "Way to Get Married" on the playbill from September 1828 pictured right. They included Newark in their schedule, and one of their ten children, Melinda Brunton Smedley, was baptised there at the parish church of St.Mary, on 22nd November 1804. (Interestingly this was actually Melinda Brunton Smedley's second baptism: She is also recoded in the registers for Boston in Lincolnshire where she was baptised on 31st March 1804). The birthplaces (or, more accurately, christening places) of Joseph's children reflect the wanderings of the family around the theatrical circuit: After Melinda at Boston and Newark in 1804 comes Helen (1807) at Holbeach, Lincs; Annett (sic) (1810) at Hedon, Yorks; Henry (1811) at Hedon, Yorks; Joseph (1816) at Sleaford, Lincs; Abraham (1818) at Sleaford, Lincs; George (1820) at Ely, Cambs; and Georiana (1823) at Alford, Lincs. 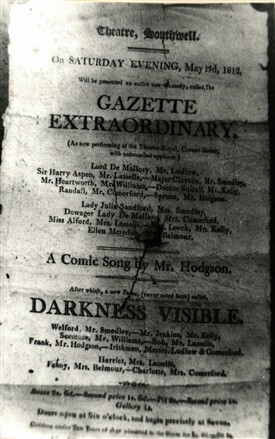 Helen and Annett - the eldest daughters - may be seen listed amongst the company of players in the second and third playbills right, where they are identified as Miss H and Miss A Smedley respectively. In 1825/6 Joseph opened the New Theatre (now the Playhouse) at Sleaford in Lincolnshire, the town in which he was to make his home for the rest of his life. He sold the Sleaford theatre in c.1841 and stopped touring. Taking semi-retirement at Sleaford he bought a printing business. He died on 1st March 1863. This page was added by Website Administrator on 17/01/2017.